A new supercomputer dubbed Aurora, and expected to become the fastest in the USA, is in the works. This exascale computer (capable of exaFLOP of performance - equal to a quintillion floating point computations per second) will be installed in the Argonne National Laboratory in Chicago and put to task by the US Department of Energy (DOE). Aurora is a co-developed project from Intel and Cray, and as it is targeted for 2021 delivery will be based upon some future technologies from Intel's roadmaps. In comparison with the fastest supercomputer running today, Aurora is about 7x faster, or about 1,000 times faster than the first petascale systems that begun to come online in 2008. Considering Intel's contribution, the Aurora supercomputer will "incorporate a future Intel Xeon Scalable processor, Intel Optane DC Persistent memory, Intel’s Xe compute architecture and Intel OneAPI programming framework". Cray's contribution will be its next-generation supercomputer system, code-named 'Shasta', which will comprise more than 200 cabinets and include Cray's Slingshot high-performance scalable interconnect and the Shasta software stack optimised for Intel architecture. What will all this computing power be tasked with? According to Intel's blog post on the news, Aurora will handle both traditional HPC tasks plus AI, to "give researchers an unprecedented set of tools to address scientific problems at exascale". Problems such as extreme-scale cosmological simulations, discovering new approaches for drug response prediction and discovering materials for the creation of more efficient organic solar cells will fall under Aurora's remit, it expects. U.S. Secretary of Energy Rick Perry (left, power stance) and Intel CEO Bob Swan. Aurora was featured in a New York Times story a few hours ago, which quoted Raja Koduri (SVP of Intel's core and visual computing group) as proclaiming "We want to make exascale computing available to everyone". Koduri also explained, via Twitter, that the Xe GPU was supposed to be called the eXe, a contraction of 'eXascale for everyone'. 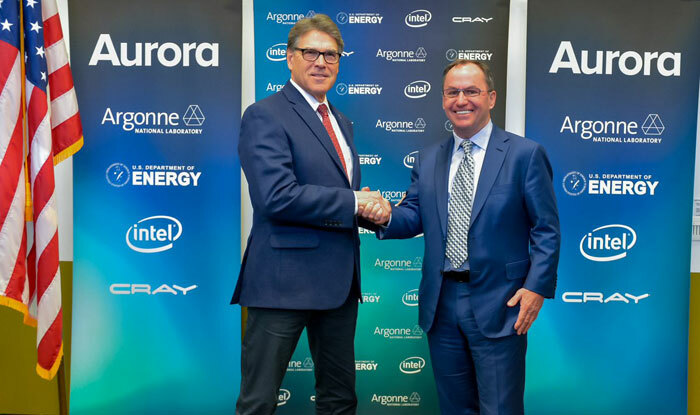 Intel and Cray are expected to deliver Aurora to the DOE, at a cost of approx $500 million, sometime during 2021. In Australia, “Exe” pronounced like “XE” means “extremely expensive”.